Thank you to everyone who donated so generously to the No Hassle Fund at Family Fun Night. The winners of the gift certificates will be announced soon! If you haven’t donated yet, there is still plenty of time! 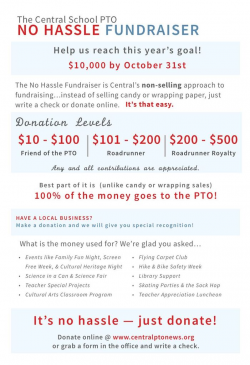 To donate, go online at the PTO website www.centralPTOnews.org and click the DONATE button on the right side of the page, or submit the attached form with a check to the Central office. You can also make a donation with check, cash, or credit card at Family Fun Night – just look for us at the PTO table! All families who make a donation by (or on) Family Fun Night will be entered to win a gift certificate to a local business!